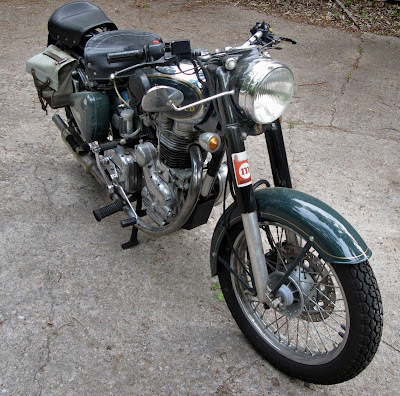 "A few years ago, I purchased a '99 500 Deluxe in blue as my first motorcycle after about 20 years. I just loved it but sold it to purchase a Ural because my wife would not ride pillion and it was a bit slow for Tucson traffic. "My first ride on a Bullet, though, was an Athena Grey 500 and I've been looking for one ever since. For the most part, as I'm sure you know, Athena Grey was the 350's color of choice. When I saw your post about the 'honest 350' for sale -- near Tucson, even -- it seemed too good to be true. Sadly, it was -- but it got the juices flowing to own a Bullet again. I then found another one in Colorado -- but missed it too. Nuts! "It seems true for Bullets, as for most other objects of our desire, that the one for you will appear. Such was the case for my 2002 350ES Deluxe. "I found it hidden in the Adventure Rider forum. It had been owned and well loved by a Master's student at UT Austin who used it as his primary transport. He was moving back east to get his Ph.D. and hadn't planned to take it with him. We had a couple of phone conversations and after a Paypal transaction, it was mine. "It had the disk brake kit (I like that) and the right-shift conversion (the jury's still out), separate seating and an 18-tooth front sprocket. I'm planning a few cosmetic touches and some general cleaning. 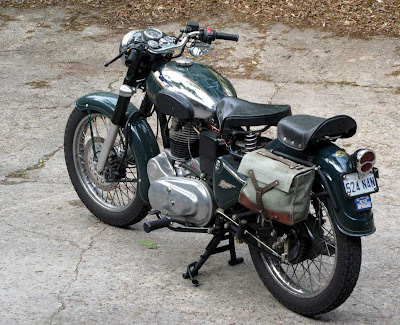 "I must say, it is a gentler thump than the 500 and an all-together more relaxed ride. Maybe it's my knowing that it's a 350 and I don't expect too much from it, just an enjoyable run around; time will tell. "I'm a true Anglophile. I have almost all of Gordon May's oeuvre on my bookshelves. The Bullet is one of four bikes in my stable, the others being a BMW R1200C, Ural Night Sentry and Harley 1200 Sportster Roadster. "Yes, I compromised on the color. I can always get the Grey bits to replace the green ones. I have to say, I've never seen a green Deluxe, though. Even the Classic Motorworks folks said they haven't seen one. It has a regular VIN number though, so it's not a Grey market import. No pun intended, sorry." I, too, have never seen a green Deluxe Bullet. And check out the rear-view mirror on the casquette! I've never seen that done before, either. "I have the original chrome fenders that make my 350 a 'real' Deluxe. The previous owner swapped them for green ones and I think the look is much more pleasing." Glad to see you got the bike you really wanted Rod, thats what it's all about! I rode a 350 on demo and straight away it appealed as it is a thump, but gentler. When I have some money again, (god knows when), I want a 350 to join my other bulls. I'd sent a note to Dave earlier. I do have the chrome fenders but the PO took them off and replaced them with Green to match the tank. I like that much better, though I have yet to find a listing for that Green Delux tank! all list 350 Deluxe models. I'm pretty sure that this isn't a one-off. The mirror mounting looks like a 60s BMW. I'd like one of those too, someday!